Now that the painting project is done, I have to decide which home improvement project to work on next. I don't think I am ready to start another painting job yet, and it is supposed to be hot again this weekend, so I probably won't want to work outside much. There is a project sitting in the garage that I initially thought of way back in early spring : shelves for Kirby's room. I bought a length of board and planned to sand and stain it, but it was too rainy, or too hot, or I wanted to wait until I had repainted the room... Well, now those excuses aren't valid, so maybe I will get moving on that. Maybe. I am pretty good at procrastinating on projects unless I set a firm (although completely arbitrary) goal. Should I do that? OK. By Monday, I want to be able to report progress on the shelf project. There. Hold me to that, will you? Gladly:) I am not doing much better. Have soooo many projects not done yet. 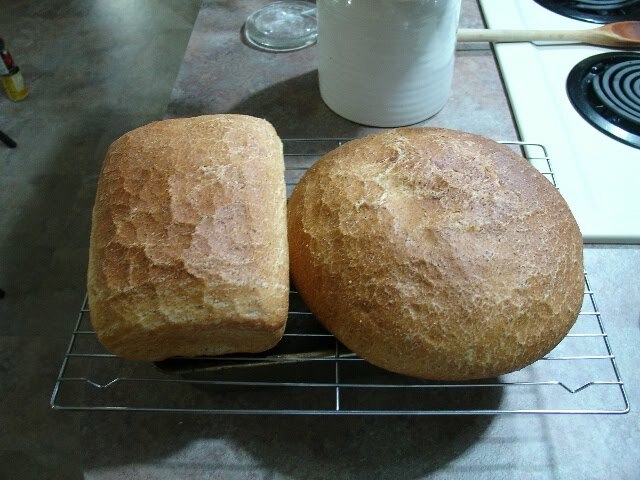 The bread looks so yummy and I could almost smell it.